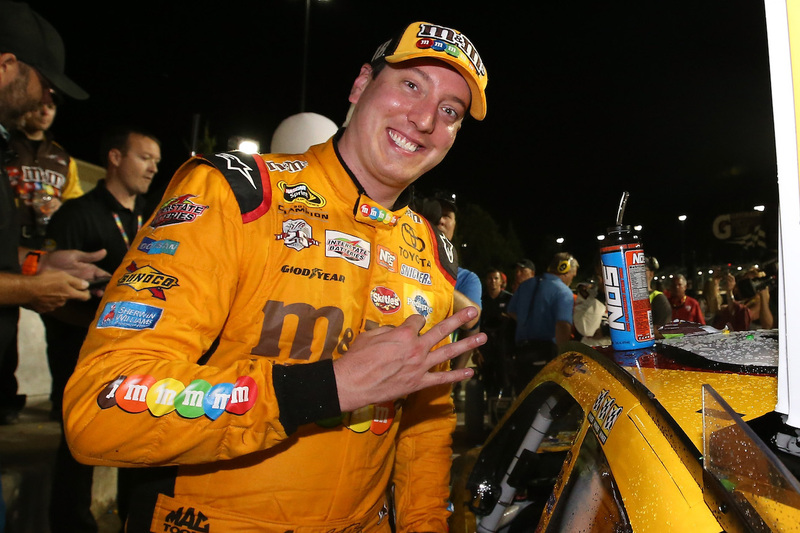 Kyle Busch last night added another trophy to a rapidly growing collection, winning ‘Best Driver’ at the 24th annual ESPY Awards, held at the Microsoft Theater in Los Angeles. Busch, the 2015 NASCAR Sprint Cup Series champion, received the most votes among fellow nominees 2015 IndyCar Series Champion Scott Dixon, 2015 Formula One World Driver’s Champion Lewis Hamilton, 2016 Indianapolis 500 winner Alexander Rossi, and 2015 NHRA Pro Stock Champion Erica Enders-Stevens. Busch’s dramatic championship run began with a wreck at Daytona that broke his right leg and left foot, which forced him to miss the first 11 races of the season. Soon after his return, Busch unleashed one of the more memorable championship runs, one that featured three consecutive wins – including a victory at Indianapolis Motor Speedway – and a walk-off victory in the season finale at Homestead-Miami Speedway to secure his first premier series title. Busch became the eighth NASCAR driver to win the award in the last ten years. Other winners include Kevin Harvick, Tony Stewart, Jimmie Johnson (four consecutive years) and Jeff Gordon.